This issue of Technology News and Trends features site-specific approaches for applying, optimizing, and evaluating the potential for or efficacy of bioremediation approaches such as subsurface injection of microbial cultures or emulsified vegetable oil. The "Technologies: Remediation" focus area of the U.S. EPA's CLU-IN website provides additional project profiles of bioremediation strategies such as bioreactors, biowalls, bioventing, bioaugmentation, and biostimulation. The area also provides links to key references including AFCEE protocols, ITRC guidance, and interagency training sessions. To learn more, visit: www.clu-in.org/remediation/. The U.S. Department of Defense (DOD) has completed pilot-scale work on the "MAG-1" site at Fort Dix, NJ, to test suitability of anaerobic bioremediation for an aquifer with low pH. Project results will be used to design full-scale ground-water treatment at MAG-1. In addition, technical criteria gained from the demonstration will be integrated into DOD’s remediation strategy for its many facilities situated above low-pH Coastal Plain aquifers. As part of recent DOD facility realignment, Fort Dix now operates as an Army Reserve and National Guard training reservation. The facility is located in central New Jersey's Pine Barrens region, within the recharge area of the Kirkwood-Cohansey Aquifer that serves as the primary source for the area's domestic wells. As a result of past discharge of chlorinated solvents during motor pool operations, the MAG-1 site contains a significant and cumulative trichloroethene (TCE) plume within a Class 1-A aquifer situated wholly beneath the property. The aquifer comprises primarily silty fine sand, with chlorinated volatile organic compound (CVOC) contamination primarily in the upper part of the formation in a saturated thickness of approximately 10 feet. Baseline studies of the aquifer indicated a pH of 4.2 to 5.3 and a positive oxidation-reduction (redox) potential ranging from 40 to 145 mV. Sulfate concentrations were relatively low (27-61 mg/L), and dissolved iron concentrations ranged from 3,500 to 7,500 µg/L. Primary contaminants are TCE and cis-1,2-dichloroethene (cis-DCE), at pre-treatment concentrations of 30-1500 µg/L and 190-1300 µg/L, respectively; vinyl chloride (VC) concentrations were below detection limits. An initial qPCR (quantitative polymerase chain reaction) analysis of site samples for the dechlorinating organisms Dehalococcoides spp. (DHC) revealed that native DHC were present in relatively low numbers (below 105 DHC/L). Although anaerobic bioremediation has been used widely for treating ground water contaminated with chlorinated ethenes (particularly tetrachloroethene [PCE], TCE, and cis-DCE), past applications have been ineffective in low-pH aquifers due to minimal natural biodegradation activity. In addition, PCE and TCE degradation that does occur tends to accumulate cis-DCE as a terminal end product, without proceeding to ethene. Formation of large contaminant plumes in low-pH environments over time reduces utility of common remedial alternatives such as in situ chemical oxidation and decreases practicality of adjusting pH for the purpose of increasing natural biodegradation. Bioaugmentation suitability tests for MAG-1 began with laboratory microcosm tests. Results confirmed that dechlorination was extremely limited at the low natural pH; even pH adjustment resulted in limited dechlorination by indigenous microbial populations. Testing also suggested that native DHC were unable to efficiently degrade cis-DCE and a "cis-DCE stall" was occurring in microcosms. 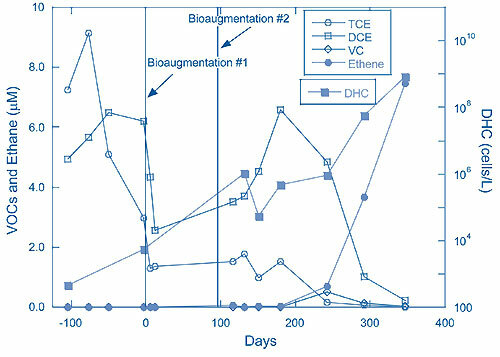 In contrast, microcosms inoculated with a bioaugmentation culture (SDC-9™) and adjusted to pH levels greater than 6 demonstrated progression of TCE and cis-DCE dechlorination and production of stoichiometric amounts of ethene. Microcosm results were verified and an extended laboratory column study was conducted to gather additional data on dechlorination rates, bacterial transport, and aquifer buffering. Bioaugmentation evaluation in the field involved construction of a recirculation system to capture ground water at an extraction well and re-inject it at an injection well approximately 40 feet upgradient. The design provided a re-circulating treatment loop approximately 15 feet wide and 10 feet below ground surface (bgs). In addition, two monitoring wells were installed between the extraction and injection wells. All wells were screened across the entire contaminated saturated zone. Laboratory tests and ground-water flow models were used to estimate the amount of sodium bicarbonate required to raise ground water pH to above 6 and to determine the amount of electron donor (sodium lactate), nutrients (diammonium phosphate), and bacteria needed to facilitate in situ bioremediation. The ground-water circulation system initially operated at a flow rate of 0.5 L/min to create a 30-day hydraulic flow time between the injection and extraction wells. Start-up operations in late 2007 included characterization of the flow system and efforts to reduce redox potential. The first bioaugmentation event involved injection of 10 liters of SDC-9 culture (containing a DHC titer of 1011 DHC/L) directly into the recirculation loop. Upon observation of a pH spike to above pH 9 and loss of bioaugmentation substrate, a second, identical injection was conducted approximately 100 days later. Each culture cost approximately $1,000. DHC numbers in the aquifer subsequently increased to approximately 108DHC/L in a row of monitoring wells located 20 feet from the injection wells, which suggested significant in situ growth and distribution of organisms concomitant with CVOC dechlorination. SDC-9 bioaugmentation in the re-circulation loop reduced the CVOC concentration to approximately 20 ppb within one year (Figure 1), from a combined TCE and cis-DCE concentration of 1,500 ppb prior to treatment. Figure 1. Performance monitoring of aquifer bioaugmentation during the MAG-1 demonstration showed significant production of vinyl chloride, as a TCE degradation end-product, beginning approximately 140 days after the second inoculation. It was difficult to achieve and maintain an acceptable pH in the treatment zone. During the first three months of operation, more than 1,700 lbs of sodium bicarbonate were injected into each recirculation loop. To reduce the excessive labor or automated loading costs associated with administering this volume, which was significantly higher than estimates derived from earlier testing and the column study, sodium carbonate was selected as an alternate buffering agent. The sodium carbonate additions were found to cause the pH spike observed approximately three months after the first injection. Buffering in the form of carbonate also led to excess fouling of the injection wells, which necessitated periodic well redevelopment and a reduced volume of buffering agent. To maintain a suitable pH during the remainder of the demonstration, a total of 2,400 pounds of sodium carbonate was used. Analysis of post-injection data indicated that DHC growth could not be stimulated in the aquifer without pH adjustment, despite existence of the organisms at measurable levels, and that pH adjustment alone could not facilitate biological degradation of cis-DCE and VC. Results demonstrated that complete dechlorination could be achieved by concurrently adjusting the pH to a level greater than 6 and inoculating the formation with bioaugmentation cultures. Full-scale bioaugmentation at Fort Dix is expected to begin this summer, in accordance with final cleanup goals set by the New Jersey Department of Environmental Protection. The demonstration was conducted under DOD's Environmental Security and Technology Certification Program, in conjunction with development of bioaugmentation guidance for DOD and the U.S. Department of Energy. Optimization of an emulsified vegetable oil (EVO) delivery system led to uniform distribution and ongoing biological treatment of a PCE source area last summer at the former Naval Training Center (NTC) in Orlando, FL. Remedial efforts targeted contaminated ground water at a former laundry and dry cleaning facility at NTC's Operable Unit 4 (OU4), where earlier injections of potassium permanganate (KMnO4) failed to reduce contaminant concentrations in the source area. Performance monitoring last fall indicated that the EVO system was operating successfully and aquifer conditions were favorable for enhanced reductive dechlorination (ERD), with total organic carbon (TOC) concentrations approaching 200 mg/L, in contrast to a pre-treatment average of approximately 10 mg/L. Contamination of OU4 ground water was attributed to past spills and leaks in drain lines, floor drains, and other components of the dry cleaning facility's wastewater collection and conveyance system. Subsurface investigations detected PCE concentrations reaching 22,600 µg/L, which suggested the presence of dense non-aqueous phase liquid (DNAPL). From March through October 2003, a KMnO4 recirculation delivery system was implemented. Subsequent field studies indicated that the elevated natural oxidant demand of the aquifer material had caused formation of manganese dioxide solids, which in turn plugged the KMnO4 injection wells and limited oxidant distribution. In 2006, an optimization study was conducted to evaluate viable remedial alternatives for addressing the remaining DNAPL source area. Enhanced in situ biodegradation using EVO was selected as a cost-effective strategy to treat source-zone contamination, reduce mass flux, and control plume migration over time. Recirculation initially was selected as the delivery method most likely to uniformly distribute EVO in the 60- by 80-foot source area. The target treatment zone was defined by a PCE concentration of 2,000 µg/L, approximately 1% of the compound's aqueous solubility. Target depths extended through a shallow source area above a 5-foot cemented sand unit located 20-25 feet bgs. 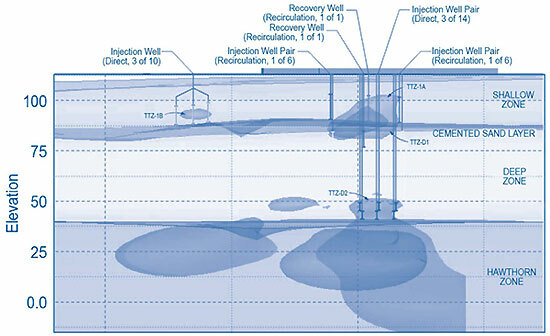 The delivery system comprised a central recovery well surrounded by six equally-spaced injection wells. Based on short-duration aquifer performance tests, an average extraction rate of 2.5 gpm was expected in the shallow zone (5-20 feet bgs) (Figure 2). Figure 2. Treatment of ground water at NTC OU4 involved optimized delivery of EVO through a system of shallow-zone recirculation recovery wells and injection wells. EVO application began in September 2007 with ground-water recovery from the single extraction well. Based on the design flow rate, the anticipated duration of recirculation (one pore volume) was 14 days. Performance monitoring indicated that the maximum sustained extraction rate of 1 gpm was well below the design flow rate of 2.5 gpm, and that two monitoring wells (MW1 and MW2) within the recirculation footprint had not been impacted by EVO recirculation. Inadequate distribution of the EVO was attributed to poor extraction from the central recovery well. As a result, the recirculation effort was abandoned after approximately 10% of the design volume was injected (approximately 8,200 gallons of a 1% EVO solution). Following the initial EVO recirculation event, analysis of ground water in MW1 indicated PCE concentrations had increased from 1,800 to 3,500 µg/L, and daughter products TCE and cis-DCE also increased an order of magnitude. In MW2, PCE and TCE concentrations remained unchanged, but cis-DCE decreased an order of magnitude. Vinyl chloride was not detected in samples from either monitoring well, and no changes in TOC were observed. A significant decrease in redox potential, from -70 to -252 mV, was observed in MW1 after two months of recirculation. In addition, geochemical indicators suggested that sulfate and iron reduction were occurring, but methane concentrations were unchanged. Evaluation of the initial attempt to recirculate EVO in the shallow zone led to several "lessons learned." A longer aquifer test would have evaluated sustainable injection and extraction rates better, thereby optimizing design of the recirculation system array. Distances between the injection and extraction wells may have been too large to achieve adequate control of the injected EVO. In addition, injection of EVO at a higher concentration may have resulted in better substrate distribution in the subsurface. Subsequent optimization activities involved: (1) bench-scale tests to determine the adsorptive oil capacity of the soil and optimal EVO dose; (2) an evaluation of EVO delivery options; and (3) a pilot-scale study to determine optimal injection spacing. Bench-scale tests were performed on two shallow (fine sand) and two deep (fine to medium sand) samples collected from outside the target treatment zone. Results indicated a median adsorptive capacity of 0.00384 (pounds of EVO per pound of soil), which was greater than three times the adsorptive capacity assumed during EVO recirculation. Direct-push technology (DPT) points rather than permanent injection wells were selected for EVO delivery due to the high cost and extensive field resources associated with installing numerous permanent wells. In addition, deployment of temporary DPT points could focus EVO injection in a discrete vertical interval. A March 2008 pilot study evaluated 5- and 7.5-foot radii of influence for injection point spacing. The 7.5-foot radius was selected for full-scale delivery due to an increase in TOC and positive results from a bromide tracer test in the monitoring wells. Full-scale injection of EVO, using 22 DPT points spaced 15 feet apart, was conducted in July 2008. A 4-foot screen was used to inject 66,888 gallons of a 2.1-6.3% EVO solution over an interval of 8-20 feet bgs. Ground-water samples from MW1 and MW2 in November 2008 indicated that TOC concentrations had risen from 10 mg/L to 160-180 mg/L. In MW1, PCE concentrations decreased from 1,800 µg/L to 756 µg/L, while TCE increased from 64 µg/L to 914 µg/L, cis-DCE increased from 87 µg/L to 11,700 µg/L, and vinyl chloride increased from non-detect levels to 92.9 µg/L. Similarly, concentrations of PCE in MW2 decreased from 18,000 µg/L to 184 µg/L, while TCE decreased from 1,200 µg/L to 38 µg/L, cis-DCE increased from 1,500 µg/L to 9,210 µg/L, and vinyl chloride increased from non-detect concentrations to 2,800 µg/L. Ethene was detected in MW2 at concentrations as high as 19 µg/L. Methanogenesis within the treatment zone was evidenced by an increase in methane concentrations of up to 7 mg/L. In addition, Dehalococcoides ethenogenes was detected within the treatment zone in populations reaching 7.61E+03 cells/mL. Overall results based on formation of TCE daughter products and the shift in aquifer geochemical conditions (from moderately reducing to highly reducing methanogenic conditions) indicate that EVO optimization has improved enhanced reductive dechlorination of OU4 ground water. Further optimization of the ERD system will be conducted based on future monitoring results. Scientists and engineers from the private sector and EPA are evaluating the potential for in situ bioremediation and/or natural attenuation to successfully treat residual soil and ground-water contamination after source-area in situ chemical oxidation (ISCO) treatment. The studies were prompted by concerns that the two treatment technologies may be incompatible due to detrimental impacts on microbial communities as well as decreases in aquifer permeability resulting from ISCO. Recent field evaluation at a former manufacturing site in Framingham, MA, and other investigations indicated that adverse impacts from ISCO were not permanent and did not affect subsequent enhanced in situ bioremediation or natural attenuation. An approximate 2,000-ft2 TCE plume existed at the Framingham site as a result of past activities involved with electronics manufacturing. The plume contained TCE in high concentrations of approximately 22,000 ppb and 1,000 ppb of cis-DCE and vinyl chloride, respectively, and was situated 20-35 feet bgs within layered fine sands and silts. The water table ranges from 8 to 12 feet bgs. The presence of daughter products indicated that reductive dechlorination was active. In December 2001, injection of 450 gallons of a 20% solution of sodium permanganate (NaMnO4) was performed through a single injection well screened at 24-34 feet bgs within the suspected source area. A total of 750 pounds (dry weight) of NaMnO4 was injected over two days. Permanganate was detected at least 30 feet downgradient of the injection point. Analyses of ground water at downgradient monitoring wells showed that permanganate persisted in the aquifer for approximately six months following injection. The wells also showed an immediate reduction in TCE followed by temporary rebound attributed to slow mass transfer and mass transport mechanisms. Over the following 1.5 years, TCE concentrations steadily declined to 5,000 ppb, and a small increase in daughter product cis-DCE was observed, showing that reductive dechlorination activity had rebounded. Bioremediation efforts were initiated in 2003, 30 months after the ISCO treatment, to accelerate degradation of the contaminant plume through bacterial processes. A total of 1,026 pounds of sodium lactate was administered over 1.5 years during five injection events in two of the monitoring wells located in the ISCO treatment area and downgradient of the ISCO injection well. Laboratory analysis of ground-water samples collected from treatment wells two years after the start of sodium lactate additions indicated TCE concentrations had decreased to approximately 2,500 ppb. Cis-DCE and vinyl chloride levels also increased following lactate injection. NaMnO4 and other ISCO oxidants such as hydrogen peroxide, permanganate, and ozone exhibit antiseptic properties with potential for inhibiting or killing microbial organisms involved in subsurface biotic processes, particularly under anaerobic conditions. Oxidant injection results in a significant increase in redox potentia that can interfere with reducing conditions needed under anaerobic conditions, and consequently inhibit microbial activity and contaminant transformations. To evaluate these impacts more closely, microbial communities were assessed at another site, where approximately 60,000 pounds of NaMnO4 and potassium permanganate (KMnO4) were injected into a two-acre area over one year. Bio-Trap® devices were deployed in monitoring wells for passive, in-situ collection of microbes in ground water over an extended time. Microbial sampling and PLFA analysis of three wells (a few months after and four years after ISCO) indicated an increase in post-oxidation biomass levels in monitoring wells impacted by permanganate, when compared to upgradient ground water representative of background conditions (Figure 3). PLFA data from permanganate-impacted wells also indicated a complex consortium of microbes including aerobes, anaerobes, and metal- and sulfate-reducing bacteria. Collectively, this consortium is capable of degrading hydrocarbons and enhancing reductive dechlorination of CVOCs. Figure 3. Significant changes were observed between pre- and post-oxidation microbial biomass in wells impacted by permanganate at one study site. No loss in permeability was observed at the Massachusetts facility, in contrast to common assertions that reduction of permanganate ion consistently leads to manganese oxide (MnO2) accumulation in porous media and associated reduction in permeability and treatment efficacy. A critical analysis of MnO2(s) accumulation in porous media indicated that MnO2(s) precipitation filled approximately 8% of the void volume in a porous medium with an oxidant demand of 50-60 g/kg. Other mechanisms such as MnO2(s) particle transport and filtration, mechanical straining, electrostatic interactions, chemical bridging, or specific adsorption may cause immobilization of MnO2(s) particles within porous media and lead to changes in permeability. Study of ISCO applications at multiple sites showed that KMnO4 injections typically involve concentrations of 2-3 g/L, which are below the solubility (6.5 g/L at 20°C), but are sensitive to temperatures. For example, differences in temperature between the KMnO4 solution in a mixing tank and the (cooler) aquifer can result in precipitation of KMnO4 in the aquifer, causing rapid but temporary permeability reduction. In addition, insufficient pre-injection mixing duration or methods can produce an injection solution containing a significant quantity of KMnO4 particulates. Study findings indicated that although accumulation of KMnO4 particulates in the aquifer can decrease permeability, the effect typically is temporary due to dissolving of KMnO4 over time. Similarly, generation of carbon dioxide gas caused by microbial activity or oxidation of organics can temporarily decrease permeability before the gas dissolves in water. Results at the Massachusetts site and two other sites gave no indication that ISCO resulted in sterilization of aquifer material or permanent inhibition of microbial activity. In subsurface systems, contact between oxidant and microbial populations can be limited due to preferential pathways and microniches, allowing microbiota to survive rigorous applications of oxidant. Spatial separation between oxidant injection into source areas and downgradient microbially active areas also diminishes the impact of the oxidant. Potential for successful bioremediation and/or natural attenuation following ISCO applications may vary with oxidant, physical and chemical characteristics of subsurface materials, or varying contaminant concentrations and characteristics. EPA continues to collaborate with federal and state agencies to develop tools for using in situ bioremediation as a treatment option for subsurface DNAPLs, particularly those associated with chlorinated ethenes. In June 2008, the Interstate Technology and Regulatory Council (ITRC) issued a guidance entitled In Situ Bioremediation of Chlorinated Ethene: DNAPL Source Zones. The document covers technical and regulatory issues related to bioremediation technology selection, applicability, design, and operation and monitoring. The full guidance is available on the ITRC website (www.itrcweb.org/Documents/bioDNPL_Docs/BioDNAPL3.pdf). The ITRC also delivered a recent internet seminar on in situ bioremediation of chlorinated ethenes in DNAPL source zones. As a companion to the 2008 guidance, the seminar summarized general steps available to practitioners and regulators for objective decisionmaking on bioremediation technology assessment, monitoring, and optimization in DNAPL areas. The seminar presentations may be viewed in EPA's CLU-IN online archives (www.clu-in.org/conf/itrc/bioDNAPL_090908). This seminar will be offered again on June 11, 2009. CLU-IN's contaminant focus area on DNAPLs offers a range of bioremediation information applying to DNAPL treatment. Topics include overviews of chemical and behavioral aspects, environmental occurrence, toxicology, detection or characterization, and treatment technologies such as soil vapor extraction, solidification, and thermal processes. The DNAPL focus area is at: www.clu-in.org/contaminantfocus/default.focus/sec/Dense_Nonaqueous_Phase_Liquids_(DNAPLs)/cat/Overview. The University of Massachusetts' Environmental Institute and the U.S. EPA Office of Superfund Remediation and Technology Innovation will host the International Conference on the Environmental Implications and Applications of Nanotechnology on June 9-11, 2009, in Amherst, MA (www.umass.edu/tei/conferences/nanoconference/#c).